I have been a PocketWizard user for years. In my collection of wireless studio flash triggers are the PocketWizard Plus, PocketWizard Plus II, PocketWizard Flex TT5, and PocketWizard Mini TT1. About 8 years ago, I tried the cheaper eBay triggers that came out of China and had such a horrible experience with them that I refused to look at any trigger designed by a Chinese company. There was a long period of time when PocketWizard was the only brand I trusted when it came to wireless flash triggers, but how times have changed. I am now in a transition period, where I am beginning to phase out my PocketWizard collection and adopting some Chinese brand triggers with complete confidence. Why the change? – Because these new triggers come from China are reliable (so far), and they offer coveted features for the fraction of the price of more expensive PocketWizard remote triggers. My move away from PocketWizard began with the PocketWizard (PW) Flex and Mini versions of the triggers. I was an early adopter of those triggers when they first arrived in the marketplace. I was excited by the promise of wireless ETTL and PocketWizard’s Hypersync features, but in reality, these new flash triggers gave me nothing but grief and a lighter wallet. The first PW Flex I purchased fried my Canon 580EX II flash. I emailed LPA Design to make them aware of the situation, only to have them point to my Canon Speedlite for the failure. There were many stories from other people about the risks of the PW Flex with Canon’s 580EX II flashes, which I ignored, but when it came my turn to lose an expensive flash unit, I couldn’t just chalk it up to coincidence that my flash happened to fail when paired with the PW Flex TT5. Since I own a couple of Canon 430 EXIIs, I decided to try the PWs with them, and they fired fine at close range. At longer ranges during real world events, the PW Mini TT1 and Flex TT5s were completely unreliable, so I lost all confidence in the PW Flex and Mini system. When an event photographer loses all confidence in a wireless system, it basically means it’s time to get rid of that system. But what was I going to replace that system with? Enter the Phottix Strato II. There was a time when I was a brand snob. I wouldn’t use any equipment that the top photographers wouldn’t consider, but after a lot of researching, I discovered all the positive reviews of the Phottix Strato and Odin systems, so I had to give it a try. Having used the Phottix Strato II for about four weeks now, I can say with full confidence that they work! Phottix Strato II – Yes, they simply work. The PocketWizard Plus IIs I own also work well, but they don’t have the ETTL pass through functionality I so desperately need for my event work. The PW Plus IIs also don’t have a hotshoe connector for the receiver, so I was always reliant on caddies and cables to connect my PW Plus IIs to my speedlites. For light use, this isn’t a problem, but every once in a while, a loose cable meant lots of wasted time and money trying to get my speedlite flash to fire. ETTL pass-through: Why is ETTL pass-through so important? With the Phottix Strato II, I could now manually trigger speedlites from across the room, but also have a speedlite connected to my camera via the Strato II. This enabled me to use the on camera flash for fill or bounce light (either in manual or ETTL mode), while using the off-camera flash as a back light, rim light, or also for fill. This configuration worked wonders during events such as weddings. Focusing in dark environments: Here’s another benefit. Because I could attach my 580EX II speedlite to my camera, I could use the speedlite’s IR focus assist for autofocusing in very dark environments, which still having access to my off camera speedlites across the room. 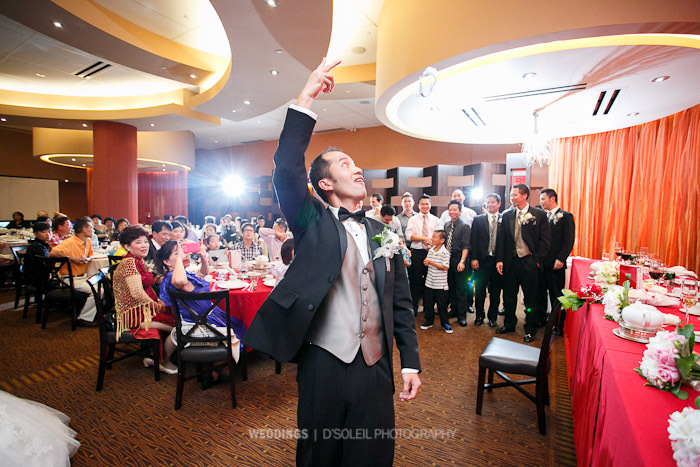 This feature has been extremely useful during dances at event receptions and other times when the lights went dim. Wedding photo of the garter toss using Phottix Strato II triggers with a 430EX II flash mounted on the camera via a Strato II transmitter through it’s ETTL hot shoe pass-through, triggering 2 580EX II from behind subjects. Manual trigger: The Phottix Strato II triggers are easy to use because they are mainly a manual trigger (i.e. there’s not wireless TTL functionality). In many ways, this is a major benefit to me because I never really needed the ETTL functionality for my off camera flashes, and this extra feature added to the higher price tag of the PW Flex and Mini triggers, not to mention very unpredictable flash output on the few occasions when off camera TTL worked for me. AAA batteries: This many seem to be a minor benefit, but for me, it’s actually a big one. The PocketWizard Mini-TT1 remotes used button cell batteries, which were relatively expensive and sometimes difficult to find. 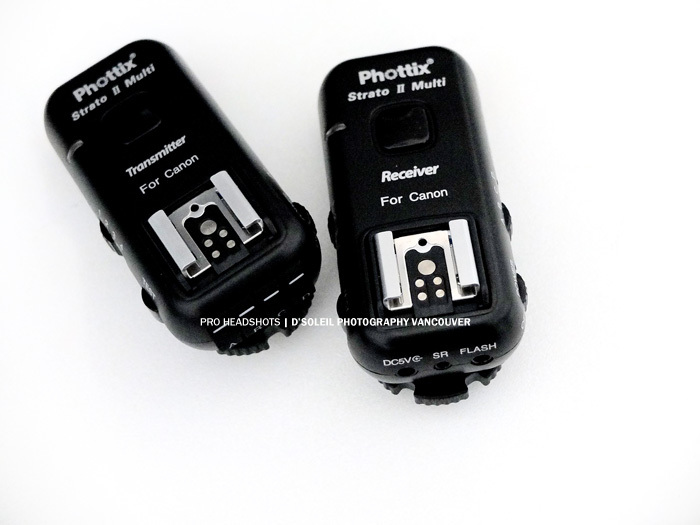 I ended up buying a button cell battery recharger to help keep long term costs down, but now I really appreciate that the Phottix Strato II triggers use standard AAA batteries, which I can buy just about anywhere. Build quality: This is one point that worried me about the Phottix Strato II units, but having used them for a few weeks, I can confidently say that the build quality almost as good as the PW triggers. I say “almost” because the PWs do feel a little more solid, and the Plus IIs have lasted for years. Nonetheless, I’m satisfied with the build quality of the Strato IIs for now. Need ETTL? Get the Phottix Odin: Yes, Phottix has a line of triggers for those who need remote ETTL and remote flash control – it’s called the Phottix Odin. With the Odin, you get the ETTL and the ability to control both ETTL ratios and manual power on your remote speedlites. I haven’t purchased any Odins yet because I don’t use ETTL for off camera speedlites and because the Odin doesn’t have a ETTL hotshoe pass-through on the remote. When Phottix decides to offer the features of the Odin with an ETTL pass-through, I’ll be all over it like pigs in mud. In the meantime, you can also check out the Yongnuo Y-622C triggers if you are interested in wireless ETTL and a transceiver with a hotshoe ETTL pass-through. PocketWizards: I still like much of what PocketWizard is doing. They’re continuing to release firmware updates that may make the Flex and Mini triggers a workable system, but for me, I need remotes that work now, not months or years down the road. A few of my fellow photographer friends have Flex-TT5 and Mini-TT1 units that work reliably, while others don’t. When it comes to professional work, I need something that works 100% of the time, so for now the Phottix Strato II speedlite triggers are my go-to remotes. Conclusion: When it comes to remote triggers, reliability has to be the most important feature. No headshot photographer (like me) wants to have to walk across a room multiple times to check on why a speedlite isn’t firing, and for an event photographer, an unreliable remote trigger is like having no remote trigger at all. When I used only PocketWizard Plus II transceivers, triggering speedlites and strobes was a happy experience, but when I adopted the Flex-TT5 and Mini-TT1 units, that all changed – Off camera flash photography became unreliable, even when I was only using the manual trigger option set in firmware. The came the Phottix Strato II system and I was a happy photographer again. The Strato II are a less expensive system with none of the ETTL or PW HyperSync (or high-speed sync) capabilities so desired by many photographers, but at least they are well built, easy to use and maintain, and very reliable. For now, the Phottix Strato II are my flash remotes of choice and whatever PocketWizards I have left have been designated to the sell on Craigslist box in the closet of my office. Headshot Photographers, here’s how you travel light! Last year, we decided to close up our bricks and mortar photography studio in New Westminster and go completely mobile. We discovered through working with our clients that they often prefer to have a professional photographer visit their office to do head shots. In many cases, it means more business for you as a photographer because they will often book you to photograph a longer list of people. After doing this a few times with my studio gear, I really started to hate lugging around all that extra gear that is actually meant for a studio and not mobile use in rainy Vancouver. I’d had my share of lugging around heavy lighting stand bags and cases for my monolights, not to mention my camera bag, which was always on the heavier side. So recently, I said goodbye to my studio equipment and started to build a kit for mobile use. Here’s what I came up with base on extensive research and months of actual in-field use: “The Ultimate Vancouver Headshot Photographer‘s Mobile Toolkit”. This list is ordered by the level of highest benefit for mobile on-location portrait work. Items near the top are things I can’t live without and things at the bottom are nice-to-haves, but not as critical. This is bag I really can’t live without. It’s a smaller roller bag, but it carries just about everything I need for a headshot session on location. It won’t carry all my lighting gear, just my Canon flashes (aka. 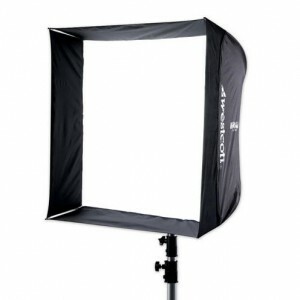 speedlights), but it will take 2 bodies and all the lenses I need. 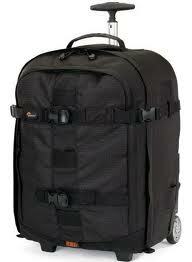 I chose this bag because it can be easily converted to a backpack in case both my hands are busy with other gear. On a recent business trip to Calgary, Alberta I had no problems bringing this on board WestJet. I stuffed it pretty well and my only warning is that it will fit very snug in the overhead compartment. Had I got the x450 version, I’m not so sure it would have passed a carry-on luggage. As a Vancouver headshot photographer, going downtown to do corporate headshots is a real pain the neck from carrying all that heavy equipment from parking lot to corporate office. Having a roller-bag is a real life saver and it just looks more impressive to walk into an office with all your gear stuffed neatly into a small bag, rather than crash in with five camera bags hanging off your shoulder. I can’t believe that I used to haul a full background system around just for a headshot. What was I thinking? After years of filling my car with background stands, poles, clamps, and of course a long roll of background paper, I had enough and picked up a Lastolite Collapsible Background. I have the 5×6′ version in White and Mid-Gray. There is also a White and Black version, but I rarely ever shoot against a black background nowadays. Folded, the background is about 1/3 of it’s size and relatively easy to carry around. It’s still big, but no where near as big and heavy as a full background system. If you do decide to get this background, I also recommend getting the Bracketed Stand. 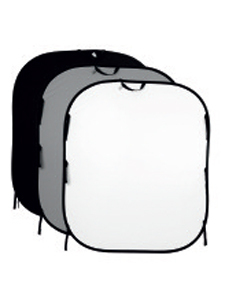 It’s light and collapses to a small enough size to fit into any lighting bag. It will save you time and headaches trying to hang the background. This lightstand and umbrella carry bag will carry almost everything a headshot photographer needs. I’ve stuffed up to 4 lightstands, and smaller Manfrotto tripod, a reflector arm, the Lastolite Bracketed stand, Photoflex umbrellas, the Westcott Apollo 28″, and several other small items in this bag (and checked it in at the airport too!). It’s not padded, so you need to add some padding or make sure it’s checked in with the fragile luggage, but man, does this think hold a lot of stuff. In future, however, I will be looking into a bag with wheels, but for now, this one bag takes care of all my on location lightstands and grip needs. These are the 6.75″ stands I often use for rim and fill lighting. They work great with my Canon 580EX II flash units and lightweight strobes such as the Elinchrom Ranger Quadra or even Alien Bees or Einstein E640 monolights from Paul C. Buff. I even used it with my bulkier PCB White Lightning monolights before with no problems – although be warned that you can’t use oversized modifiers (e.g. 53″ Elinchrom Octa Light Bank) with these light stands, they are simply too lightweight for that sort of thing. I love these stands because they are small and they click together, make it very easy to carry around three lightstands. If you are going to buy these lightstands, buy them in the 3-pack, you’ll be glad you did. These are the bees knees (if you know what that means, you rock!). I love Elinchrom lighting equipment. They are one of the top lighting companies out there. The only other ones that are better are Profoto and Broncolor, but those are the Lamborghini’s and Bugattis of the studio lighting world. 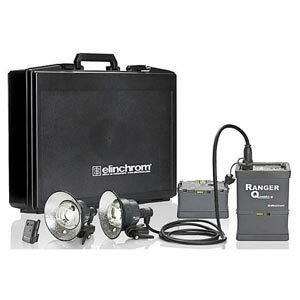 Elinchrom is up there with their Ranger series as well, but a little less expensive overall. The Elinchrom Quadras give off beautiful consistent light and have been around for a few years now. People who own them love them for their portability, and at 400ws max, the power output is good enough for most portrait situations, but it’s the overall convenience that draws me to these lights. They are battery powered as well, meaning you don’t need to worry about bringing along a long extension cable – and thus one less thing to worry about! They may seem expensive, but how many speedlights would you need to output 400ws? Maybe four or five? And do speedlights have modelling lights? Nope, they don’t and you need modelling lighting in some low light portrait situations. You simply can’t function without modelling lighting in some office spaces or homes, so the Elinchrom Quadras help solve a huge problem for me on location. And why the Elinchrom S head vs. the Quadra A head? Because for most portraits, you don’t need the extra flash speed. 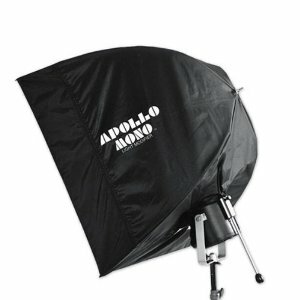 I love these softboxes, especially my 50″ Apollo, and the only reason they aren’t listed higher is that there are so many good light modifiers out there. Some I’ve tried and others that have excellent reviews, such as the Photek Softlighter II and the Elinchrom Rotalux series of modifiers. I love these modifiers because they help create even lighting and they work with just about any strobe out there (for the Quadra, an umbrella bracket is needed). The Softlighter II does a similar thing, and perhaps even gives off slightly softer light. I’m looking to purchase the Apollo Orb too, so perhaps that will find a spot on a future list. If you’re a Canon shooter with a 5D MKII or other camera with fine-tune calibration options, the Reikan FoCal may help you. I say “may” because there are few minor bugs with the system, but in theory, it should help you get better focusing results. I’ve used it and for most of my lenses, it appears to have helped improve autofocus, which saves me a lot of time and frustration. The one major downside is that it only works on Windows computers, so if you don’t have a PC, get a Windows emulator or get something like the SpyderLensCal Focus Calibration Tool or LensAlign MKII Focus Calibration System.